What does the oil price collapse mean for Canada? A simple question with an the answer that is anything but simple. As the Governor of the Bank of Canada (BoC), stated the "oil price shock is complex because it sets in motion several forces " that will alter the path of Canada's economic future. The Governor goes on to argue that "it may take up to three years for the full economic impact to be felt, and even longer for all of the structural adjustments to take place.” Just what are the structural and time factors that we need to understand as we adjust to the new environment of lower commodity prices? We start out by considering the structure of the Canadian economy. This will help identify how the various sectors of the economy will be impacted in the future. 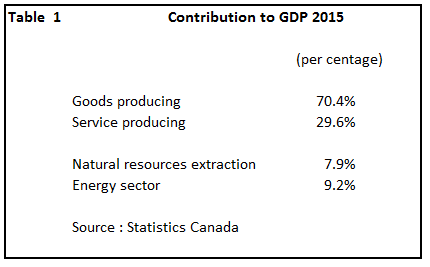 Broadly speaking, Canada is a service-based economy (70% of output) and only selectively a goods-producing country (30%). The largest component of services is the finance, insurance and real estate (FIRE) which now comprises about 20% of national income. These industries surpass the contribution of mining, oil/gas and energy distribution (17%) and manufacturing (10%). The strength of the services sector blunts much of the pain of falling oil prices. Unemployment remained steady at around 7% for the year 2015. 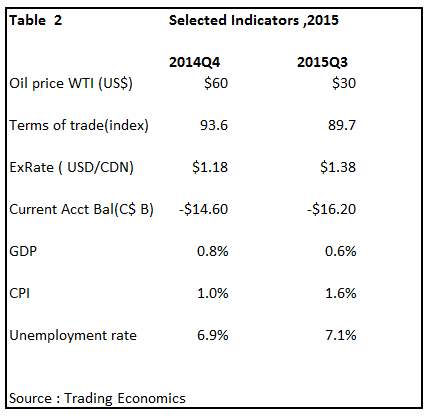 Viewed from a national perspective, the oil price collapse has had a marginal impact on the economy during 2015. The burden of adjustment has fallen almost exclusively on the exchange rate; most other indicators have not change appreciably . However, below the surface, we are seeing evidence of the deteriorating conditions. 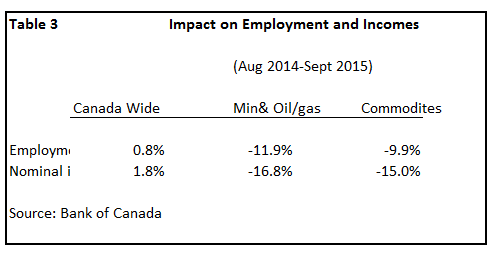 Within the resource sector, employment declined by 9-12% and incomes have fallen as much as 15-16% ( Table 3). More importantly for the future, the cumulative decline in business investment in this period was 8% and ,in the case of engineering structures, (related to resource development) the decline was 13%. The dominance of the service sector and other non-energy goods producing industries allows for national income and jobs to remain in positive territory. In other words, the impact of falling oil prices has, temporarily, been confined to the resource sector and to its geographic centre. The emphasis is on temporarily since there are longer term consequences facing the country as it comes to terms with the worldwide deflation in commodity prices. Research staff at the Bank assessed the path of economic growth over the next 3-5 years assuming that commodity prices remain at current levels. (1) Theirs is an attempt to map out the path the economy would likely take ,given the new reality of low commodity prices..
personal consumption will be lower, reflecting the reduction in incomes. These outcomes strongly indicate that it will take much longer to absorb the current excess capacity. Investment, consumption and overall growth will be lower than had the oil prices not collapsed . Simply put, the road to recovery has now become longer and steeper.